Fishing for catfish in the Mobile Delta Rivers is some of the best trophy freshwater fishing there is. My morning on the Blakely River on the east side of the Mobile Delta had been very good. I had a fine slot redfish in the box along with a couple of nice specks. Supper was beginning to look good for tonight. The only thing that kept the day from being just about perfect was the big redfish I had hooked and lost earlier. I’ll be honest here—that fish took me to school. The big red took a live shrimp off the bottom and just kept on running until the line broke. I was frustrated by the loss of that big red. And I was determined that the next big redfish I hooked today would come to the boat. Right on cue, my rod jerked toward the water, and then bent over. I let the fish hook itself as it moved away. Once again, my rod made a dangerous bow as the big, strong redfish ran powerfully for the middle of the river and pulled drag. This big bull red was in open water now, and it was just a matter of letting the rod and reel do their work and not trying to do too much to get the big red to the boat before it was ready to come. A number of strong, powerful runs and it was finally beginning to tire. As I worked the big red closer, I readied my camera for some good action shots of a bull redfish. The big red rolled to the surface and I prepared to take my pictures. But this one presented a problem. It had no broad copper-colored sides. There was no black spotted tail. This big “redfish” had smooth blue skin and small beady eyes. It had a face full of whiskers and a broad, gaping mouth. Twenty pounds of great fight did not come in the form I expected. It seems that the fish that had gotten the best of me earlier was a big blue catfish, much like the one I just caught. I was surprised. But heck, a strong fight with lots of pulling is good. And it doesn’t matter if it comes from a bull redfish or a big blue catfish. The Mobile Delta and its major rivers cover a lot of territory. There are miles and miles of big rivers in the Delta, and a newcomer to the big catfish game might be a little intimidated to learn how much water there is to choose from. We were able to talk to a couple of veteran anglers who know quite a bit about the big catfishing game, and they were kind enough to share their thoughts with us. Larry Scott owns and operates Scott’s Landing on the Causeway just west of Spanish Fort. He gives us some good information about finding the big catfish in the Mobile Delta Rivers. Scott used to fish commercially for the big cats, so he has plenty of experience and knowledge in locating the catfish. The conditions Scott refers to largely have to do with the salinity of the water. If the season has been dry and not much fresh water has been coming down the rivers to push the salty bay water south, then anglers may have to run 20 miles or farther upstream to reach fresh water that holds the big cats. Conversely, if the season has been rainy and a lot of freshwater has been running down the rivers, big catfish may be far downstream, even past the I-10 Bridge. 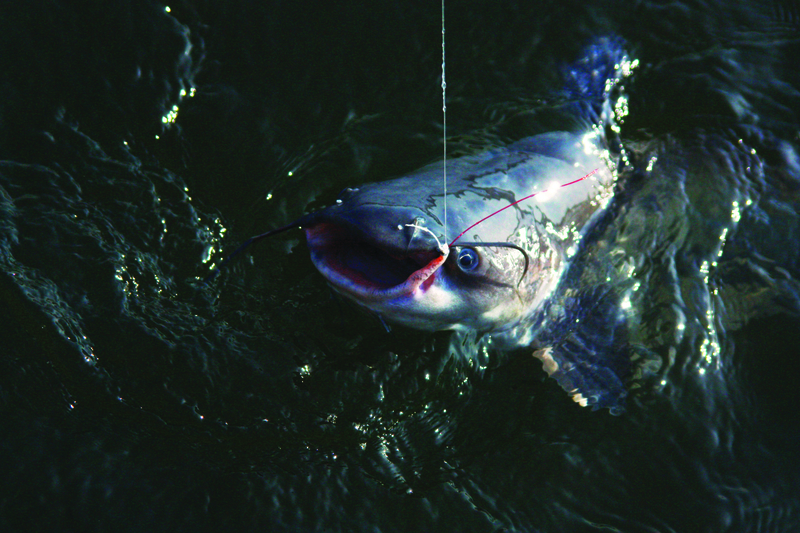 “I caught a 52-pound blue cat three miles below the Interstate on the Blakely Bar,” Scott says. For anglers who want to catch a trophy flathead catfish, finding an old treetop or other structure in the water is a good start. Flatheads like to orient to some kind of structure. If some current is present, that’s better. Flatheads are very active predators, and they prefer live bait. A hand-sized bream is just about the best flathead bait possible. The big blues are more opportunistic feeders, and they don’t insist on live bait. They will take just about anything edible that comes into their territory. And big blues don’t always stay around cover. They are often found feeding in relatively open water. Use solid line and strong hooks for big Delta catfish. This photo was taken by Ed Mashburn. Live bait is by far the best call for big catfish, and Scott tells us that his first choice for big catfish bait is freshwater herring. This oily baitfish has a good layer of fat which releases a lot of scent into the water. His second choice of live bait is freshwater skipjack. These baitfish can be caught in flowing water and around treetops where they’ll hit small jigs. Live shrimp, especially in the fall when these fine-tasting things leave their summer homes in the swamps and creeks and head for the open waters of the bay and Gulf, can be very effective when fished on the bottom. As I found out on my trip recounted earlier, it’s possible for an angler to anchor in one spot and catch redfish, trout, flounder, and even some monster-sized catfish in the Mobile Delta Rivers. They’re all there. These “noodles” are then baited up and allowed to drift with the current. When a big cat takes one of these baits, the noodle tips up on its end and can be seen for a long way, making retrieval much easier. Larry Scott tells us that big catfish in the Mobile Delta rivers never really leave, and the big blues and flatheads can be caught year-round. However, some conditions are just better than others for prime big catfish hunting. A problem that catfish anglers face when the saltwater pushes far up into the rivers is that the salty water brings a lot of “trash” fish with it—hardheads, croakers, and other bait stealers that make getting a bait to the big catfish very difficult. Launch ramps and landings aplenty on the Delta. 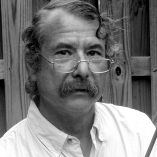 This photo was taken by Ed Mashburn. Although not too many anglers are aware of the possibilities of catching big catfish in the Mobile Delta Rivers, this is a truly big game opportunity for trophy fish, and it’s right here close to home. 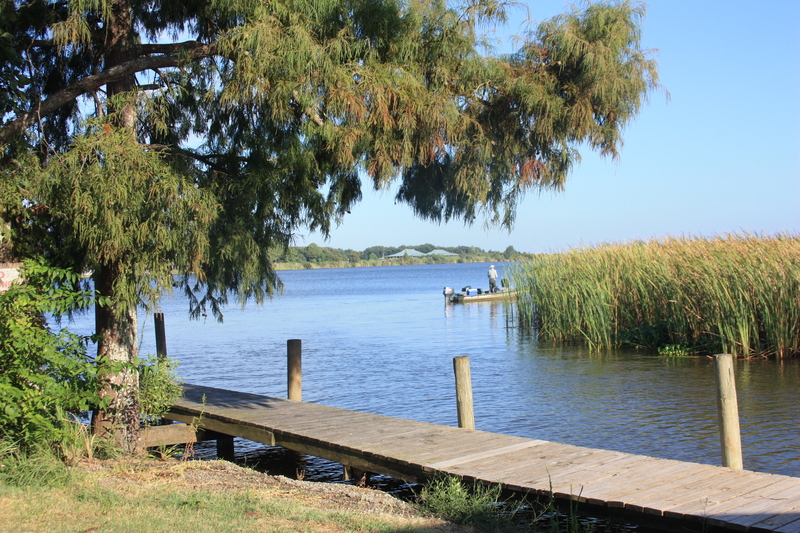 Many places are available to put a boat in and explore the big rivers of the Delta. Several fine ramps are located on the Causeway between Mobile and Spanish Fort. And on both sides of the vast Mobile Delta, fish camps and public launch ramps abound. Bait for big cats is not hard to find, and tackle requirements are simple: heavy line and stout rods and reels. Then, it’s just a matter of fishing around until the big ones are located. And you can take my word for it—a big catfish will make both you and your equipment sweat when you hook one up and it runs away from you. It’s a heavy-duty kind of fun. 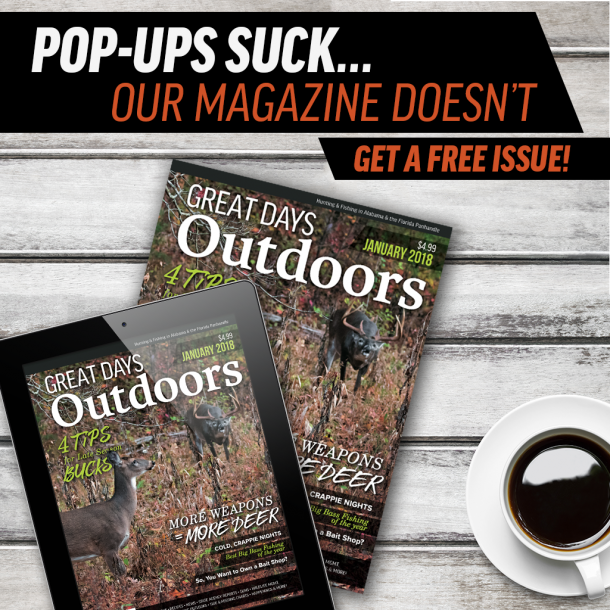 Ed Mashburn writes extensively about fishing for Great Days Outdoors. A kayak fishing enthusiast, he loves paddling into those hidden honey holes in search of all types of gamefish.